The primary concern of this book is to investigate whether or not structuralism constitutes a distinctive framework in the social sciences. The author focuses on two major structuralist thinkers, Louis Althusser and Claude Lévi-Strauss. She analyses and compares the structure of their theory, and places them within the context of their respective disciplines. 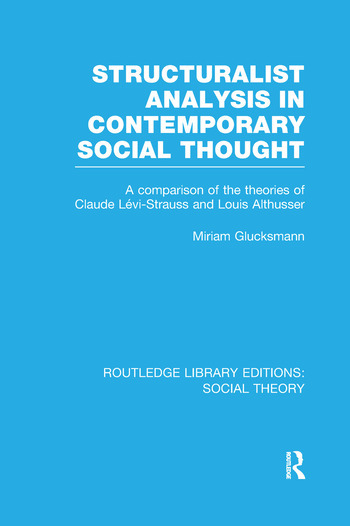 Dr Glucksmann began working on this book at a time when structuralism was at the height of its popularity in France, and was thought to be a homogenous alternative to bourgeois sociology. The progress of her study implicitly reflects the developments and divergences within structuralist thought that have emerged since then. In particular, she examines the differences between the political and philosophical thought of Althusser and Lévi-Strauss, which have become increasingly manifest.